When my daughter was 9 years old, she wanted a peach tree for Christmas. The logistics of finding and wrapping a peach tree in December in Virginia aside, we were renting our townhouse and knew we'd be moving in another year-ish (given the standard "military future uncertainty" spin on things). No peach tree that Christmas. However, after we moved here and became homeowners, we set about making our back yard a more edible landscape. Thanks to my spouse's hard work, part of the patio became a strawberry patch and raspberry canes went into a back corner with blueberry bushes and recycled raised beds along the fences. My daughter got her peach tree--two of them, in fact, one dwarf variety and one not-so-dwarf variety. In the spring the trees have beautiful blossoms, in the summer their thick foliage provides a dense patch of shade. My daughter carefully tends the trees--removing diseased leaves, thinning the branches and then the fruit, so that each peach has plenty of room and air circulation. But her dream of harvesting her own peaches has not borne fruit, so to speak. Apparently the fauna of our backyard can read the Certified Wildlife Habitat sign and think that the peaches, and blueberries for that matter, are for them. 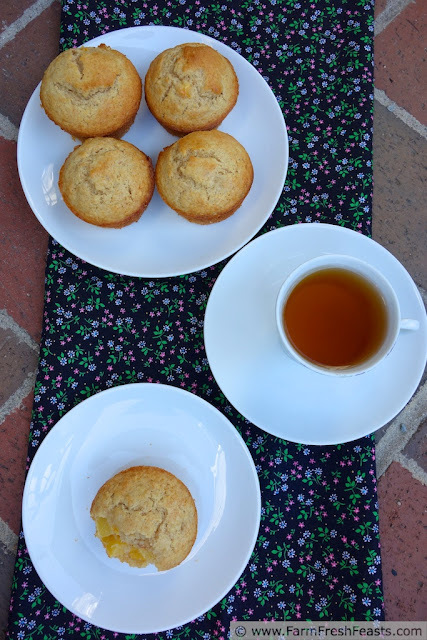 It's OK, they are eating unripe peaches, and we can get fresh ripe peaches nearby to make these lovely muffins. If you've been making ice cream lately, you may have half a cup of heavy cream left over. (If not, go out and buy a pint of heavy cream and use 1 1/2 cups for a batch of ice cream so you'll have a leftover.) Use it in these muffins! They taste so rich "almost like peach poundcake" my daughter said while polishing off the leftovers on the second day. I used more sugar than I usually use in a muffin (1/3 cup vs my usual 1/4 cup, when I remember to add the sugar) and only 1/2 cup of whole wheat flour, but this muffin recipe remains one that I'm happy to offer my kids as a snack or breakfast, not just reserved for dessert. Preheat oven to 400 degrees Fahrenheit, and spray 11 holes of a 12 cup muffin pan with oil spray (or line with cupcake papers, your choice). In a large bowl mix egg, cream, vanilla, oil and brown sugar until thoroughly combined. Dump dry ingredients on top (not the peaches yet!) and stir a few times. Dump the peaches on top, then stir until all ingredients are just combined. Scoop** (Amazon affiliate link) into prepared pan, and bake in preheated oven for 15 minutes or until tops are golden brown. Remove from oven and let sit, in pan, another 3-5 minutes before attempting extraction removing to a cooling rack to finish cooling. Serve warm or at room temperature. Delicious with buttery spread and a cold glass of milk when warm, or with a cold glass of milk in a day or two. But I’m totally with you on recipes that don’t fit standard pan sizes, why the recipe developer doesn’t, you know, realize that and make the adjustments. I should probably just scoop a little less into the muffin cups, but I'm so used to having *more* than a scoopful per pan, and roaming around adding a little drib to this cup and a bit to that cup. 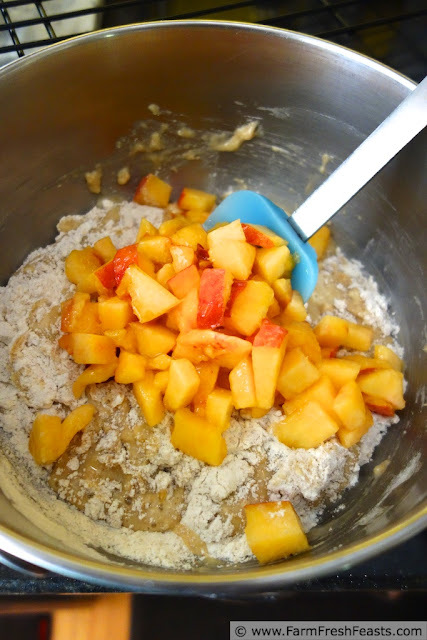 I also should have known better than to think 1 1/2 cups of flour would be enough for the pan--I use 2 cups of grains in my Soaked Oat muffins--but I was thinking the peaches would push it up to an even dozen. I'm glad that there was no fighting over the odd number of muffins--my daughter quietly and methodically made sure that she ate every one left after the initial taste testing breakfast. Yum! 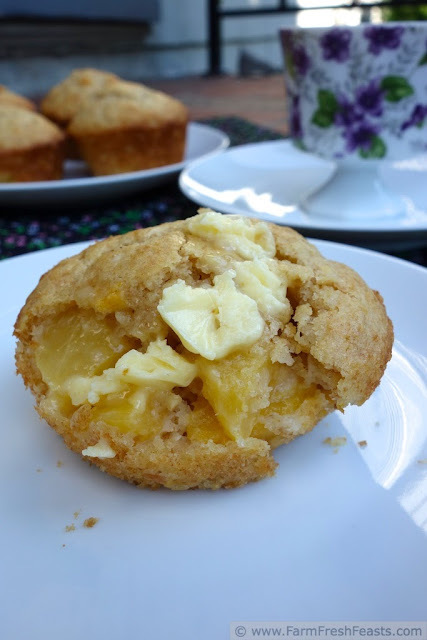 I don't usually use peaches in anything but a cobbler, or just to eat, but these muffins are going on the to-try list! Thanks! And I rarely make cobblers--which I need to remedy. I love them with ice cream, so you know, a pint of ice cream would give me leftovers to make another batch of muffins for breakfast the morning after the cobbler . . . These look awesome! I can't wait to make these. I love peaches, and they have just come into season here. Yea!!! I'm glad my timing works--peaches have just appeared in the farm stands here, too. I know you make a lot of ice cream, so the heavy cream part should be covered. Best of luck to you and your peach trees! We saw a lovely grove of ripening peaches earlier this month when we were picking black raspberries at a fruit farm, so I know at least some varieties grow here in Ohio. I'm just not sure how to keep the varmints off of them. Last year we didn't get a single strawberry, this year we got nearly all of them. There's an R&B song about Peaches and Cream (Peaches and cream / I need it 'cause you know that I'm a fiend / Gettin' freaky in my Bentley limousine) that is now playing in my head as a result of this post. We haven't gotten peaches yet, but I'm super excited for the week where we do. You can bet I'll be making these, especially since my new grill will prevent me from biting into a peach. Boo. These will more than make up for that. My daughter learned the hard way about her grill and peaches--but she snagged a bunch of the chopped peaches as I was prepping them, and ate most of the muffins, so she's managing to get her peach fix despite her braces. I feel bad for you in advance regarding corn *on* the cob. Last summer, first one in braces, I surreptitiously ate my corn on the cob in the kitchen, so as not to rub it the kids' faces. I'll probably do the same this year. Now to find the song--I was going more in an Allman Brothers direction. The song is horrible, which if you found it, I'm sure you know by now. Stick with the Allman Brothers. The corn on the cob situation makes me sad. There's nothing quite like biting into a fresh sweet ear of corn on the cob...a peach either for that matter. The fact you eat yours in the kitchen makes me like you even more. Thanks for the recipe! my first time making this. I know it's a bit of a stretch to tell someone to buy heavy cream and make ice cream merely to have the leftovers for these muffins, but I figured the hardship would be appealing. I agree, I don't get enough peaches either. I'm working on increasing my avocado intake in 2013, though, and one 'fruit with a pit in it that can grow into a tree' at a time. Not that I can grow avocados into trees--that skill is reserved for my folks, who are rooting an avocado on their kitchen pass through as I type. Oh, my! These look too good. Your photos have my mouth watering. Thank you! I spent the month of April taking a 30 Days to Better Food Photography Challenge at Learn Food Photography.com, and each day I try and put into practice some of the lessons I learned. How funny--it's like Lisa's comment above was pasted into perhaps Google Translate, translated into something and then back into English, and posted here. That's a clever trick. Yum! We just got some peaches this week and boy am I tempted to try these. We're hoping to pick up some peaches at Adams on the way back from the beach. There's something delicious about Delmarva peaches. I hope you enjoy your peaches any way you choose! Ok...it's official...I NEED these!!! 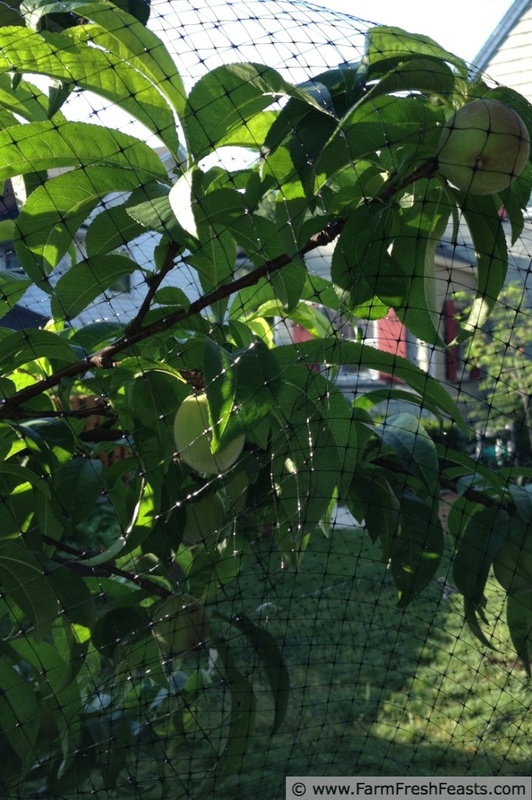 I also apparently, need my own peach trees in my backyard...lucky! You're in California--everything grows in backyards there. I think a lemon tree, getting year round citrus, would be da bomb.